I thought I had posted about all the Ozotic 700 series duochomes, but then I found pictures of 752 that I have yet to put up . 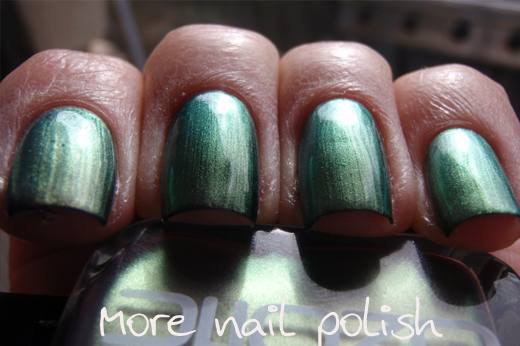 This one is really one of the best of the Ozotic duochromes. It has a really strong and obvious colour shift and it looks significantly different depending on how you layer it. First up is two coats of Ozotic 752 over black. As you can see in the first photo, the base colour is a shimmery lilac purple and the colour shift starts as an olive green and goes a light aqua green. Here is is layered over white with two light sources showing off the two colours beautifully. Over white the polish is much lighter lilac, rather than the purple it becomes over black. Finally here is just two coats of Ozoitc 752 on its own. Opacity is achieved easily and it is light, smooth and quite office appropriate. Without the black base the olive green isn't as in your face, it's much more subtle and means you can get a few very different looks. This is definitely one of my favorites from the 700 series. 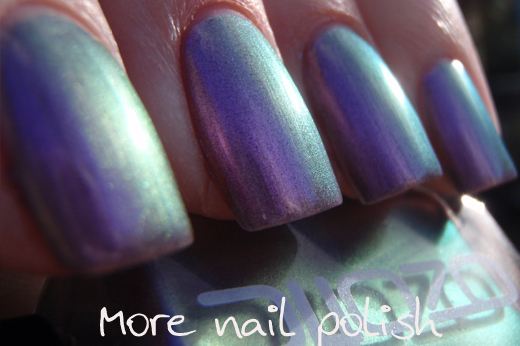 I wonder how this compares to something like Zoya Ki and Lippmann Wicked Game.